DONETSK, Ukraine -- A close ally of Kiev Mayor Vitali Klitschko and the husband of prominent journalist-turned-activist Tetyana Chornovol, was killed in action in the country’s conflict-torn east on Sunday. 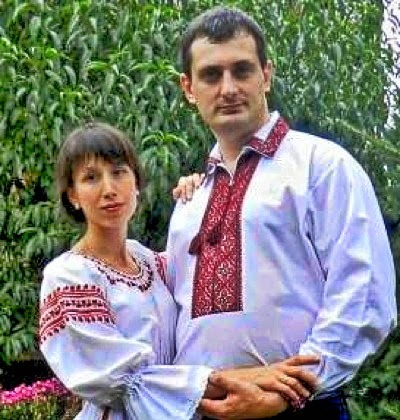 Tetyana Chornovol with husband Mykola Berezovy, killed near Ilovaysk, Donetsk region, on Sunday. Mykola Berezovy, 37, was fighting with the “Azov” battalion, a group of volunteer fighters under the control of the Interior Ministry, against Russian-backed rebels in the town of Ilovaisk some 30 miles southeast of the separatist stronghold of Donetsk when he was fatally wounded by a sniper’s bullet, said Anton Herashchenko, an advisor to Interior Minister Arsen Avakov. Since 2002, Berezovy had been married to Chornovol, a former investigative journalist who investigated corruption and exposed the lavish lifestyles of Ukraine’s elite, including Viktor Yanukovych, the former president ousted by anti-government protests known as the Euromaidan Revolution in February. A hero of that revolution, Chornovol is famous for climbing the walls of the ex-president’s luxurious estate outside Kiev, called Mezhyhirya, and posting photographs of it online. In December, Chornovol was the victim of a brutal attack that left her with a concussion, a broken nose and tissue damage to her face that required reconstructive surgery. The beating and the bloody photos of her gave further fuel to the Euromaidan movement that weeks later led to the ouster of Yanukovych. Journalists who first entered Mezhyhirya after Yanukovych fled found evidence –- including photographs of Chronovol’s car and license plate, as well as a diary kept by a Yanukovych security guard that outlines her daily movements –- they believe show he was behind the attack. Only a few days ago, one of the men suspected of beating her was reportedly granted asylum in Russia. Under the new government, Chornovol was appointed to lead Ukraine’s anti-corruption task force. In June, her husband joined the Azov battalion to fight Russian-backed separatists who have controlled much of the eastern regions of Donetsk and Luhansk for four months. It was in a battle near the regional capital Donetsk on Sunday morning that he was killed. “He was a platoon commander, our platoon was following an armored personnel carrier and was targeted by snipers from both sides," said Mykola Lyahovych, a fellow Azov fighter and eyewitness, according to local news site Ukrainska Pravda. When Berezovy, called “Falcon” by his comrades, ran to his aid, he was shot in the leg near the groin. The bullet appeared to hit a main artery. “A tourniquet couldn’t stop the bleeding,” Lyahovych said. Berezovy, the former head of Klitschko’s Ukrainian Democratic Alliance for Reform (UDAR) party in in what is now rebel-occupied Horlivka, Donetsk region, bled out while waiting for a medical assistance to arrive at the scene. Herashchenko said that upon news of Berezovy’s death, Avakov ordered for the slain fighter to be posthumously awarded with a medal for his bravery. Around 400 government troops have died in Ukraine’s “anti-terrorist operation” against separatist fighters since its onslaught in mid-April. In recent days, the military has reclaimed 75% of the territory they once controlled, and encircled Donetsk, setting the stage for what could be a bloody urban confrontation. Rebels this week told Mashable that they were willing to die in their defense of the city, saying it will be “the next Stalingrad,” in reference to the brutal World War II battle. As news of Berezovy's death spread, friends of Chornovol and her husband shared messages of sympathy on her Facebook Timeline. "Tanya accept my sincere condolences, hang in there. We must endure and fight! Glory to the heroes!" wrote Viktor Lohachov.